We assign you a dedicated 10-digit phone number. 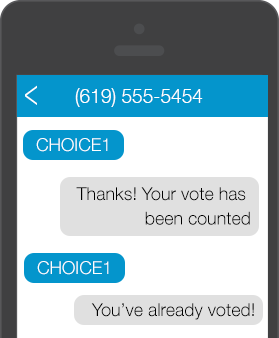 Voters send in a simple text message to cast their vote. We make sure nobody votes more than once (or as many times as you allow). You can optionally require that voters include an ID number in their message to authenticate them. Voters can vote from any web browser, no apps required. We can even cross-check to make sure they haven't already voted via text-message. Results are displayed in real-time. The results page can be easily customized to suit your needs and fit your brand. 15 days: unlimited polls, unlimited online responses, 100 SMS responses.